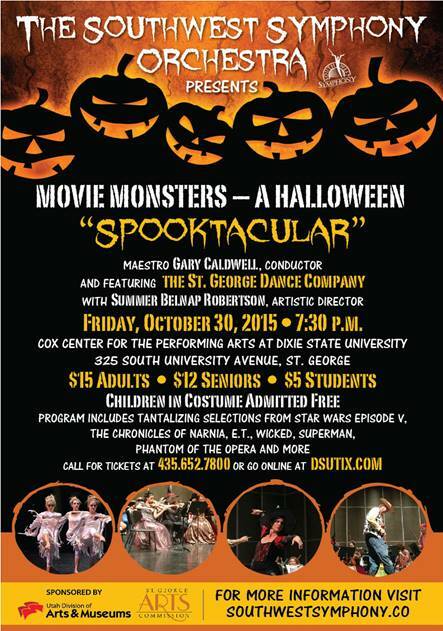 Next Friday the Southwest Symphony Orchestra presents Halloween Spooktacular! This will be an evening full of wonderful pieces from various movies that will definitely put you in the mood for Halloween! The St. George Dance Company will be a special guest. This will be a night you won't want to miss! To order tickets call the DSU box office at (435) 652-7800 or order online by clicking here. It looks like there may be a $2 service fee per ticket when purchasing online.